Being captured gives you a lot of time to think. A lot. I think could have written an entire novel in the time I was captured. Clayton had lost all track of time. He’d lost track of anything that wasn’t pain. He couldn’t feel anything because it was all one giant mess of pain. Nothing stood out… Everything must be broken, then, right? Exactly why wasn’t he dead? He didn’t know. He really had no idea why he was alive or what he was going to do to get free. He didn’t want to die here, but he couldn’t move. He was… He was as good as dead. He didn’t think that it was really possible to come back from this kind of damage, not even for a genetic freak. He’d gone over his life, thought about the things he’d done, his pathetic journey after he found out what he could do—why hadn’t he have been better? Why not be more of a hero? Someone that could have gotten out of this? He sighed. He couldn’t even lift his head to look up, but he was pretty sure he’d heard someone come into the room. The scientist, maybe? “If you’ve come to look at your experiment, I think you kind of broke it,” Clayton muttered, coughing. He shouldn’t have tried to talk. It hurt. Hurt a lot. And now he was having trouble breathing. That was not good. Very not good. He closed his eyes, not sure he could open them again. The ending to his book sucked. Here is where I died. He didn’t have the energy to come up with anything better. He should think of some kind of fitting goodbye, maybe a way to leave April a message. Maybe Larabee, too. He should do something. 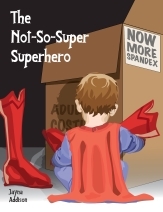 Tags: book: the not-so-super superhero, clayton moore, fiction, serial.